April 7-11 SPECIAL PRICING ! 18th Floor Beachfront. Updated coastal chic. 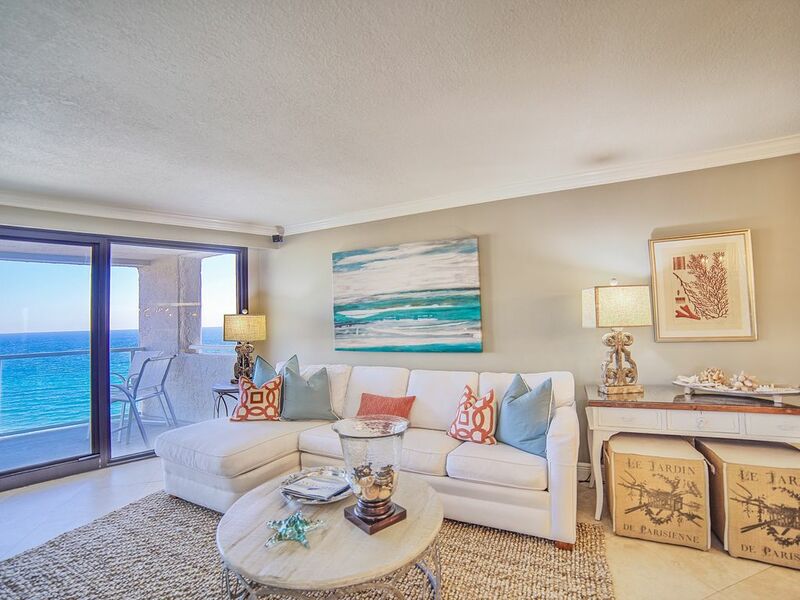 Upscale high-rise two-bedroom condo on the beach located in Sandestin Golf and Beach Resort. This unique unit has two balconies allowing views of the gulf as well as the bay side of the resort. Gourmet kitchen with granite countertops, custom cabinets, and stainless steel appliances. Outshine your friends in this dazzling condo sure to please any guest! Treat yourself to a much-needed beach getaway and you will find it hard to leave and will definitely be back. Escape the everyday stressors, dive into the unknown, bask in the sun, share unforgettable moments with our loved ones. When you find the perfect place you feel it, you can’t wait to arrive! Secure your condo now at Sandestin, Beachside II, Unit 4373! Convenient to you and boasts shops, dining, nightlife entertainment, boutiques, and so much more there is fun for everyone at the Villiage of Baytowne! Our Complementary tram service will be provided to and from Baytowne Wharf. Destin and the surrounding areas are in high demand. It’s beauty, white beaches, emerald waters, state parks, dining, shops, and well-known events attract travels all over the world. So, secure your vacation rental now. Beachside II is situated right in the heart of beautiful Miramar Beach, FL! Wake up each morning to a fabulous view of the Gulf from the 'wall of windows! This is a one of kind condo at Beachside II. Completely remodeled with spectacular views of the Gulf! You won't want to leave and you'll definitely be back! Located on the beachside and access via Sunshine shuttle to Baytown Wharf you won't miss a thing. There's plenty to keep you busy on-site or if you prefer to relax inside the condo it's comfortably furnished to please any guest! For entertainment, there is a flat screen TV in the master bedroom, TV in the guest room and a flat screen TV in the living room with surround sound. CD player and WIFI is also provided for your convenience. You can sit on your Gulf Front balcony & enjoy the view and listen to the sound of the surf. Enjoy all the activities of the resort, as well as the shopping, dining, and entertainment at the Village of Baytowne Wharf. Hope you will visit us soon! ABSOLUTELY NO SMOKING ALLOWED IN THIS CONDO OR THE BALCONIES!!! Please note that we rent Saturday to Saturday only from May 28 thru August 13. Requests for reservations other than those arrival/departures dates will not be accepted. Please note that rates are subject to change and not guaranteed until deposit and or payment in full is received. The pricing listed is current. Additional fees include $135 one time cleaning fee and 11 % Florida tax. 2. A “mandatory evacuation order has been given for the Tropical Storm / Hurricane Warning” area of residence of a vacationing guest. 3. Any advance rents collected or deposited for a reservation that is scheduled to arrive during the “Hurricane Warning” period. Overlooking the Gulf of Mexico! 36" TV with surround sound + DVD player in living room. 36" TV in master. Smaller TV in guest bedroom. Get started planning your perfect beach getaway today! Destin and the surrounding areas are in high demand. It’s beauty, white beaches, emerald waters, state parks, dining, shops, and well-known events attract travels all over the world. So, secure your vacation rental now. Beachside II is situated right in the heart of beautiful Miramar Beach, FL! Sandestin Golf and Beach Resort is a 2,400-acre destination resort in Miramar Beach, Florida, United States, on Northwest Florida’s Gulf Coast. The resort is located between the Gulf of Mexico and the Choctawhatchee Bay, in Walton County. You can’t go wrong! Memorable Gulf views, the sound of the surf, beautiful beaches, and endless fun will keep you coming back! Like so many why not make this your home away from home? The condo was exactly like it’s pictured! Decorated so cute! Right on the beach, between snow cones & cocktails. The weather was perfect! We will be back and we will absolutely stay here again!! Great accommodations, view, and location! We have been to the Sandestin area many times for Spring Break, staying in several different types of properties. This particular unit is very well decorated, maintained and a great view of the gulf, and the intercoastal, on the 18th floor! Lillian was fantastic with her communications and was very flexible with a few last minute requests we had, and we really appreciated her accommodating us! Highly recommend. Pictures are accurate - place is very nice with a great layout / floorplan, furnishings, and very clean. It was everything that we wanted in a rental on the beach! We had an excellent time on the beach in this unit! The gulf was awesome! The unit's kitchen was first class. It had everything we needed to cook if we wanted to. It was clean and quiet. It was very easy to get into and move around the resort. The communications about the unit was right on and very timely. We received all the codes and information that helped make our week an excellent experience. We loved it and are planning to return in the future! You cann't go wrong booking this unit. Thank you for a special experience! It was a beautiful stay! I wish I had had more time to stay and enjoy the condo. The condo was recently tastefully redone and was very clean! The view was incredible and I hope to come back another day for a longer visit!!! This condo was beautiful and a perfect layout. We enjoyed our stay and had everything we needed. Beautiful condo just as advertised. It was perfect for 2 couples. Please note that we rent Saturday to Saturday only from May 25 thru August 10, 2019. Requests for reservations other than those arrival/departures will not be accepted. Please note that rates are subject to change and not guaranteed until deposit and or payment in full is received.